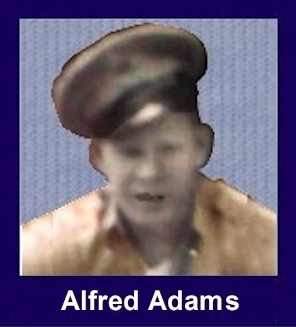 The 35th Infantry Regiment Association salutes our fallen brother, SGT Alfred Blue Adams, RA15423301, who died in the service of his country on November 27th, 1950 in North Korea. The cause of death was listed as MIA to Declared Dead. At the time of his death Alfred was 20 years of age. He was from Laurel County, Kentucky. Alfred's Military Occupation Specialty was 4745-Light Weapons Infantryman. The decorations earned by SGT Alfred Blue Adams include: the Combat Infantryman Badge, the Distinguished Service Cross, the Purple Heart, the National Defense Service Medal, the Korean Service Medal, the United Nations Korea Service Medal, and the Republic of Korea War Service Medal. Sergeant Adams was a member of Company F, 2nd Battalion, 35th Infantry Regiment, 25th Infantry Division. He was seriously wounded by the enemy in South Korea on July 22, 1950 and returned to duty on September 10, 1950. He was listed as Missing in Action while fighting the enemy in North Korea on November 27, 1950. He was presumed dead on December 31, 1953. His name is inscribed on the Courts of the Missing at the Honolulu Memorial. For his leadership and valor, Sergeant Adams was awarded the Distinguished Service Cross, the Purple Heart with 2 Oak Leaf Clusters, the Combat Infantryman's Badge, the Korean Service Medal, the United Nations Service Medal, the National Defense Service Medal, the Korean Presidential Unit Citation and the Republic of Korea War Service Medal. The President of the United States takes pride in presenting the Distinguished Service Cross (Posthumously) to Alfred B. Adams (RA15423301), Corporal [then Private First Class], U.S. Army, for extraordinary heroism in connection with military operations against an armed enemy of the United Nations while serving with Company F, 2d Battalion, 35th Infantry Regiment, 25th Infantry Division. Corporal Adams distinguished himself by extraordinary heroism in action against enemy aggressor forces when his battalion launched an attack near Chinju, Korea, on 25 September 1950. On that date, Company F, on the left flank of the battalion, was nearing its objective when it was pinned down by heavy enemy automatic-weapons and small-arms fire. Corporal Adams, exposing himself to hostile fire, went to an advantageous position, set up his machine-gun, and delivered effective fire on the enemy until his ammunition was exhausted. Leaving his position, he ran across approximately forty yards of fire- swept terrain to help a wounded man to safety, and then returned to the dangerous area and evacuated another wounded comrade. When he observed that a platoon had launched an assault on the next ridge, Corporal Adams obtained ammunition, retrieved his machine-gun and, placing it in a new position on the forward slope of a hill, delivered such accurate and devastating fire on the enemy that the assaulting platoon was able to overrun and destroy them.